Activists in Brazil are in uproar after one of the country's best-known indigenous leaders was sacked from his job with the indigenous protection service, allegedly because of his outspoken stance against the construction of a massive hydro-electric plant in the Brazilian Amazon. According to reports in Brazil, Megaron Txucarramãe lost his job late last week after years campaigning against the Belo Monte dam, which is currently being built in the Amazon state of Pará but which campaigners fear will bring environmental and social chaos to the region. 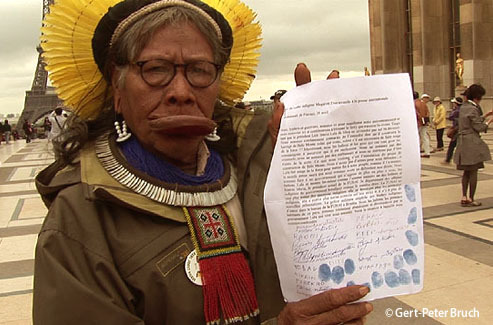 "It is political persecution," Txucarramãe told the Guardian in a phone interview on Wednesday. "They said nothing to me. They haven't said what I did wrong. They just did it [fired me]. Nobody in Brasilia called me or explained the reason. It is strange." Megaron Txucarramãe, a member of the Kaiapó people, is one of the Amazon's most respected indigenous leaders and was until this week a co-ordinator for the indigenous protection service, Funai, in the Amazon town of Colíder in Mato Grosso state. He has been highly critical of the £7bn Belo Monte dam project which would be the third largest in the world, after China's Three Gorges and the Itaipu construction on the border between Brazil and Paraguay. "I will never support the construction of Belo Monte. 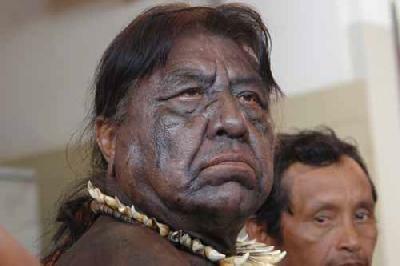 It will damage the indigenous people, the environment and the rainforest," Txucarramãe said. "The Belo Monte dam is not good for the environment, for the Indians who live nearby, for the fishermen or the river-dwellers." Environmentalists and indigenous rights activists slammed the decision to fire him. "This is one more symptom of dams versus democracy in Brazil," said Christian Poirier, Brazil programme coordinator for environmental group Amazon Watch. "Chief Megaron's sacking is yet another politically motivated and authoritarian action taken by a government that has shown itself impervious to the demands for human rights and environmental protection that the Kaiapó are fighting for." Calls to Funai went unanswered on Wednesday, a bank holiday in Brazil. The department has yet to make a public statement explaining Txucarramãe's sacking. The Brazilian government is currently engaged in a fierce propaganda war with NGOs and activists who oppose to the dam's construction. Hollywood celebrities such as Avatar director James Cameron have weighed in, supporting those fighting Belo Monte's construction. Meanwhile a leading Brazilian production company was recently hired by the consortium building Belo Monte to produce more upbeat documentaries and television programs about the project.